In the summer of 2012, Don Lubin & Ray Abair found the hybrid wood fern Dryopteris X mickelii growing in western Massachusetts. 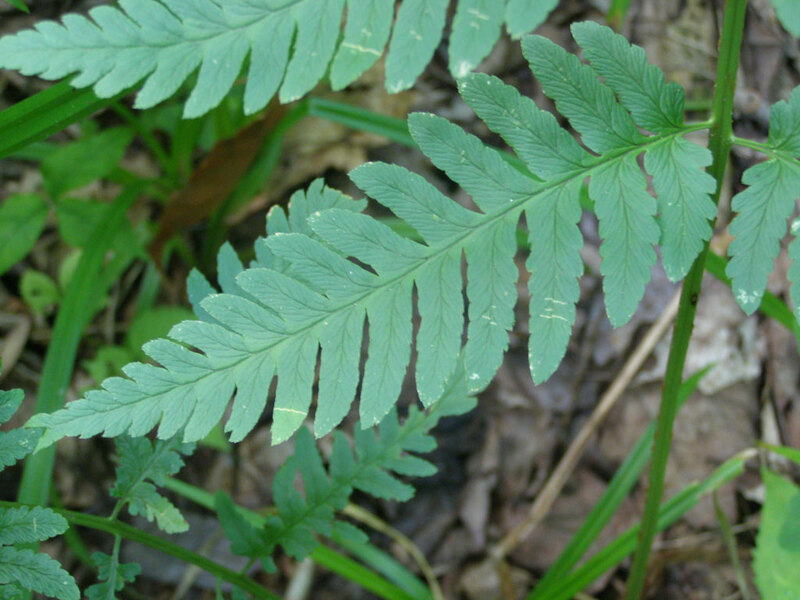 It is a cross between Dryopteris clintoniana and D. goldiana. 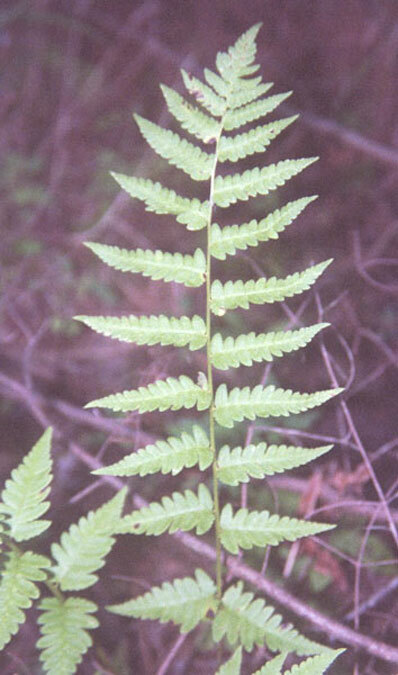 The binomial Dryopteris X mickelii was published by James H. Peck in the American Fern Journal in 2001. The name honors John T. Mickel of the New York Botanical Garden. 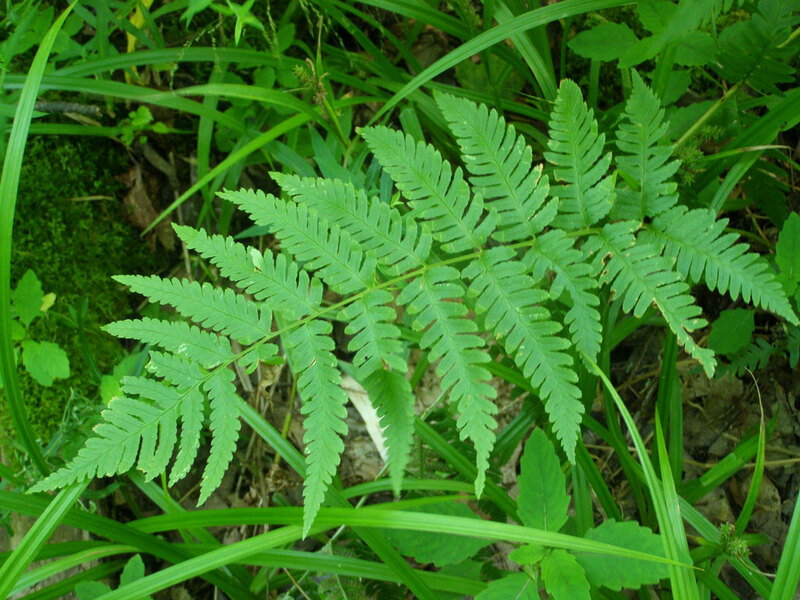 The taxon had appeared in Henry Potter's Field Guide to the Hybrid Ferns of the Northeast. Both parent species are rather uncommon, and they do not commonly occur in the same location. The global range for the hybrid runs from Ontario and Michigan to New Jersey. 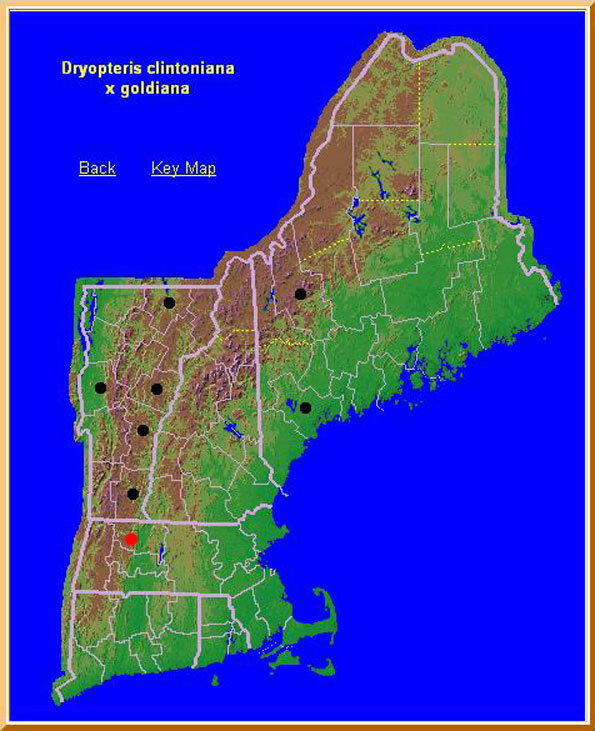 In New England it has been reported from five counties in Vermont and two in Maine. It has not previously been reported in Massachusetts. A voucher frond is in the NEBC herbarium collection. 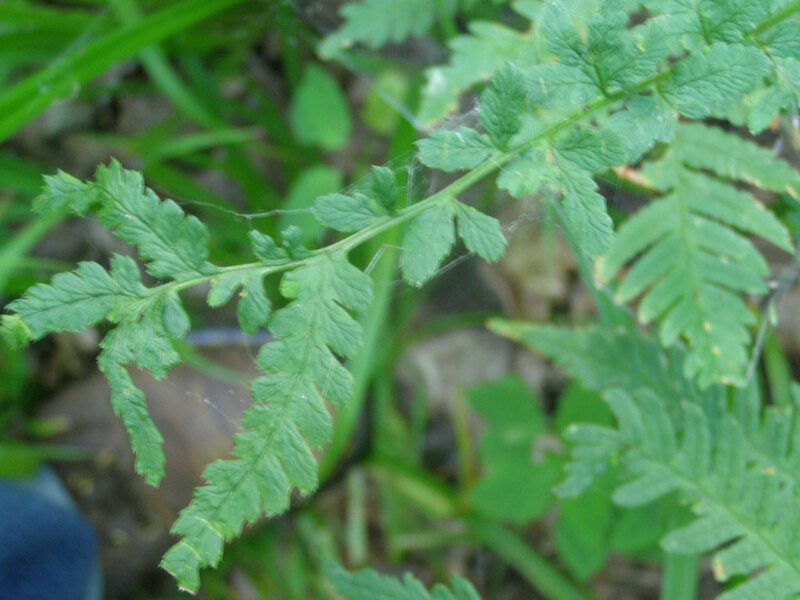 The name Simulated Log fern comes from the fact the taxon closely resembles that species, even though the chromosomal composition is a little different. Log fern has not been reported in New England. This clump was found directly between patches of the parent species, about ten feet from each, at a Trustees of Reservations property in western Massachusetts. 2. Some fronds show deformed growth. 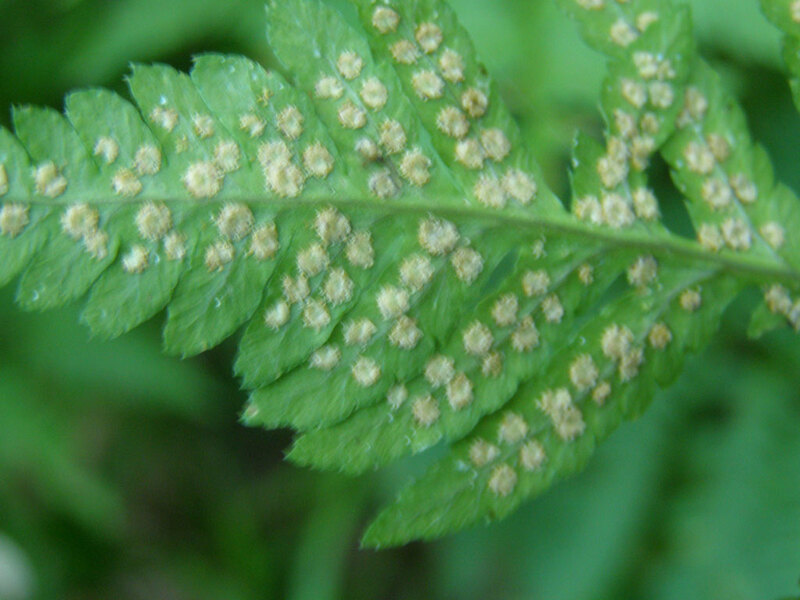 Dryopteris clintoniana spores are homogeneous. 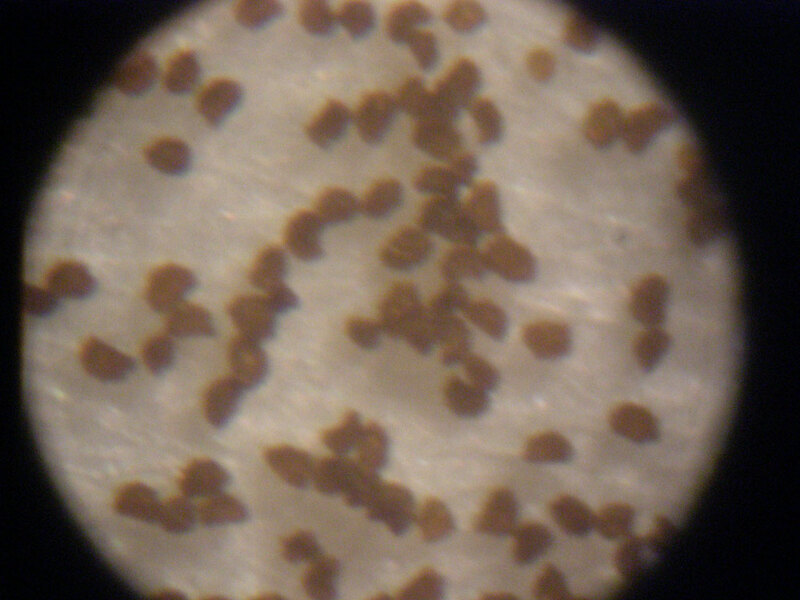 Dryopteris goldiana spores are out of focus, but also homogeneous. 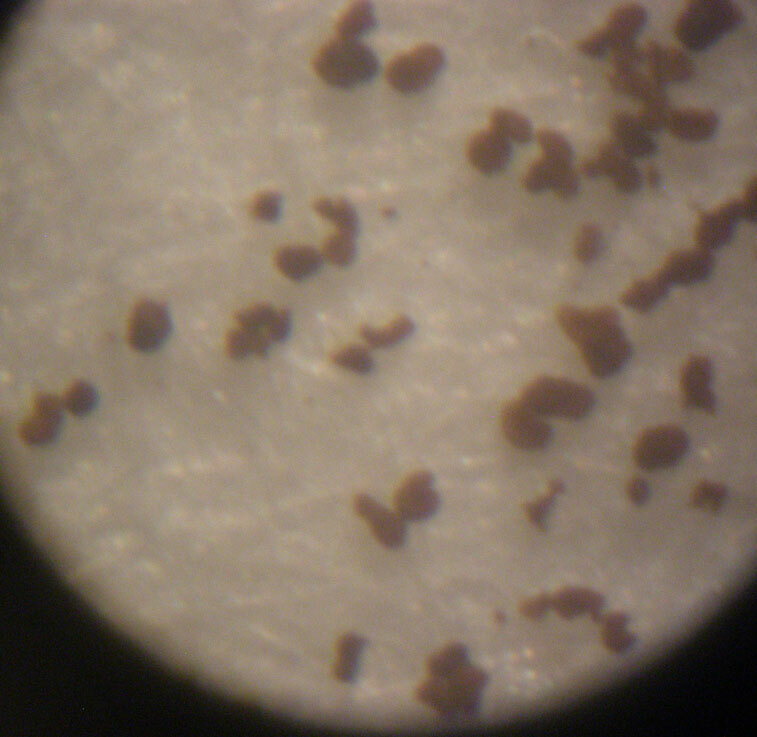 Dryopteris X mickelii spores are different sizes and shapes. Log fern is an allotetraploid formed from a hybrid between D. goldiana and D. ludoviciana by a chromosome-doubling mutation long ago. 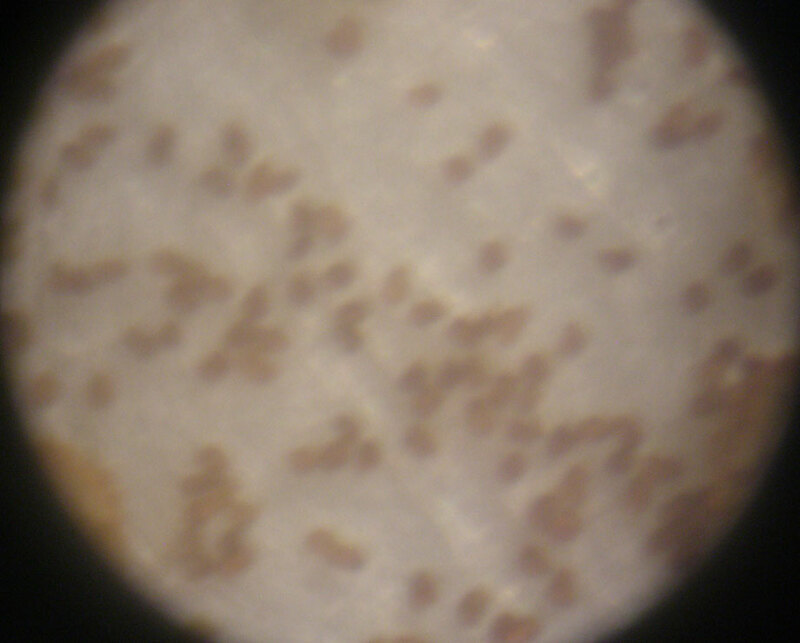 It's chromosome complement can be summarized as GGLL. 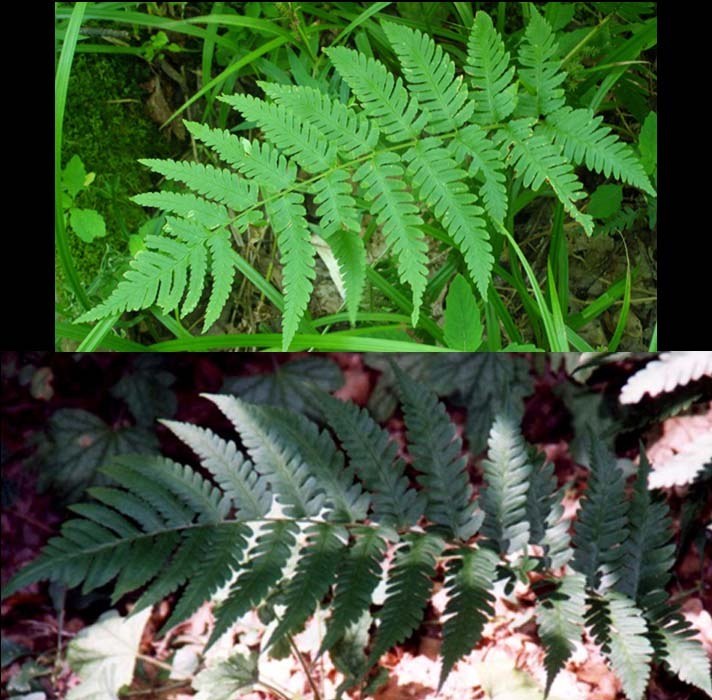 Dryopteris clintoniana, or Clinton's Wood fern, is our only native fern hexaploid, an allopolyploid of Dryopteris cristata and D. goldaina. D. cristata is itself an allotetraploid between D. ludoviciana and an unknown parent, refered to as D. semicristata because it is the other half of D. cristata. 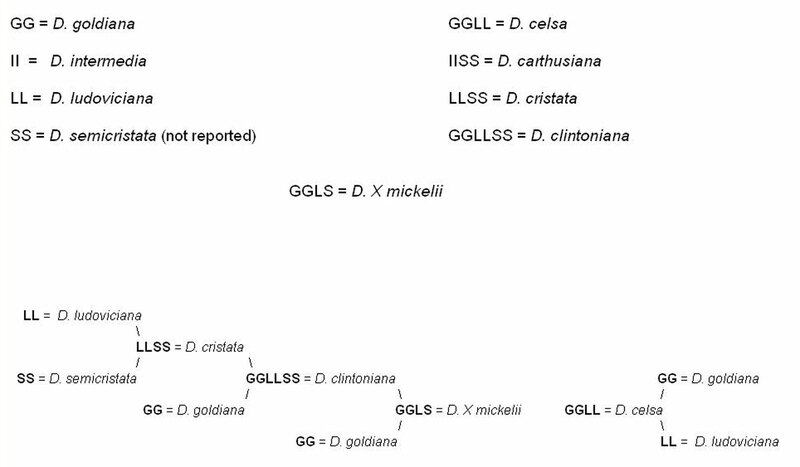 So D. cristata can be summarized as LLSS, and D. clintoniana as GGLLSS, and D. X mickelii as GGLS. 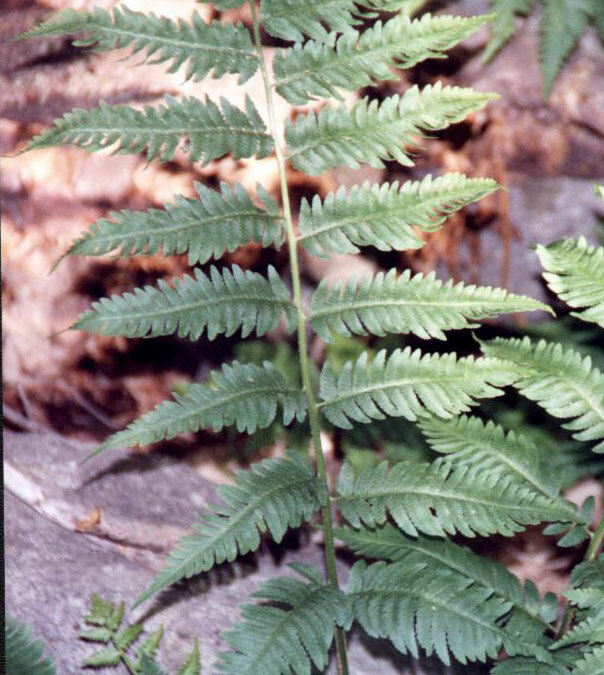 It has the same number of chromosomes as Log fern does, but one set of D. ludoviciana is replaced with a set of D. semicristata. 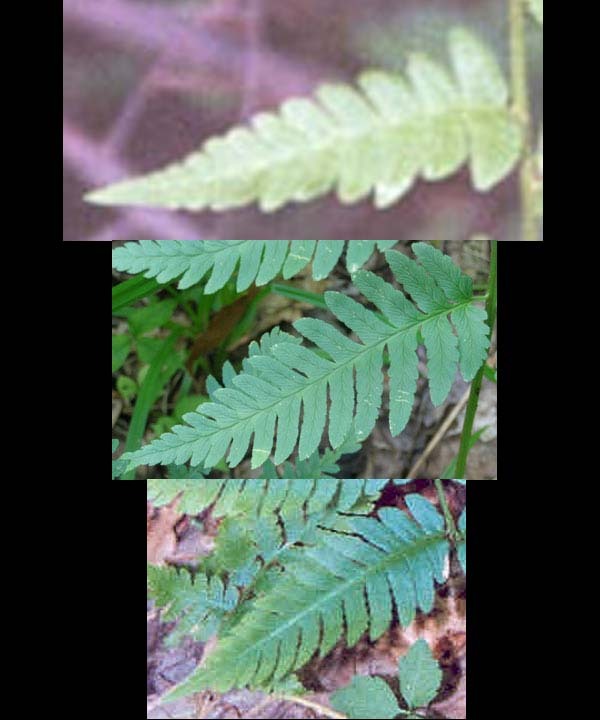 A really interesting aspect of the taxon Dryopteris semicristata is that it has never been found as a species. It is known only as an allopolyploid parent. But it is also one parent of the common tetraploid D. carthusiana, the other parent being D. intermedia.